Residents of the Mosquito Coast Area, in southern Ambergris Caye, have been complaining about the burial process at the new cemetery located there. 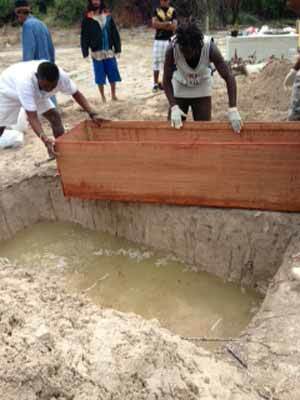 Some of the recent unfortunate burials have seen the bodies of loved ones placed directly into the ground, in partially submerged graves. For residents in the area, not only has the burial treatment violated the memory for the deceased, but they believe that it is also a health concern. Residents say that while they understand the issues surrounding the processing of the departed ones, the depth of the grave is one of “sheer, pure, unadulterated, lazy carelessness.” According to residents, considering the overall state of the ecology of the island, coupled with the rising concern about the safe consumption of sea products, it is shocking that bodies would be buried in a manner that will obviously lead to body fluids seeping into the waters. That scenario, according to residents, is enough reason to be concerned. Burial space on the island is the responsibility of the local municipality. Because the water table is high on the island, the local municipality has been advising family members to construct tombs instead of burying loved ones underground. San Pedro Town Public Health Inspector Lisa Tillett said that she has been made aware of the concerns and has personally visited the cemetery to follow up on complaints. She said that in accordance with standards in place by the Ministry of Health, if a person dies from natural causes that are not considered communicable or infectious disease, the law provides that the person can be buried between four to six feet underground. She did say that while it is not emotionally right to bury anyone in graves with water, the three recent cases of people buried in submerged graves poses no health concern to the water table on the island. She said that in accordance with the standards in place by the Ministry of Health, the process was followed properly.